I just love a good recipe. 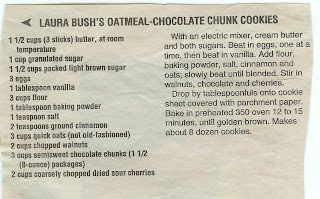 I clipped this most excellent cookie recipe from the local newspaper years ago when it featured First Lady cookie recipes. Since then I’ve gone back to this recipe dozens of times and it’s never disappointed. 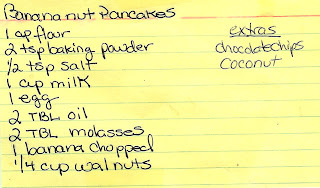 In fact, people often ask for the recipe and I’m happy to share. I consider it the best thing to come out of the last Presidential administration and it's my favorite to bake (and eat) by far. We all have our own favorite recipes, whether it’s for traditional lasagna or the perfect bowl of cereal (hey, no judgments here). As I get older and more confident, I find myself experimenting more with food and relying less on recipes and more on my creativity. Believe me, I’m no Julia Childs, and am actually kind of insecure about my cooking when it comes to cooking for people other than my immediate family. My chef hang-up has no basis because I’ve mostly avoided any major casualties, other than the horrible manicotti incident of 2004. I still cringe just thinking about it. 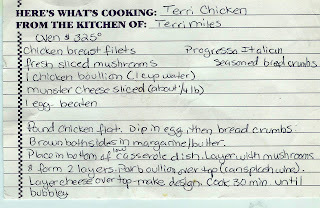 I got this fantastic chicken recipe from an amazing Italian chef and good friend and it’s always a hit. She created her own recipe after enjoying this yummy cheesy mushroomy dish at a local restaurant. Ya, she’s talented like that. She also makes a killer eggplant Parmesan and tiramisu. I like her as a person and all, but damn her food is worth sticking around for after all these years! When my grandmother was still alive, she gave me an early inheritance of her recipe cards and cookbooks. Wow, lots of jello recipes! She said that she was too tired to cook much anymore and her tried-and-true dishes she knew by heart. I’m sad that I don’t have her recipe for stuffed cabbage rolls, but luckily I have the one for her legendary Harvey Wallbanger cake. Galliano isn’t cheap, but it’s well worth it when it comes to this cake. I wonder when my children are older if they will covet any of my recipes? Will they want to fill their own homes with comforting smells of my “famous” dishes? So far it’s hard to tell – one week they like something and the next week it’s just too “boring” or “spicy” or “weird” or “don’t you remember I don’t like tomato sauce anymore?!?”. Maybe they will make more of an emotional connection to my cooking when they are older. I sure hope so. wow! 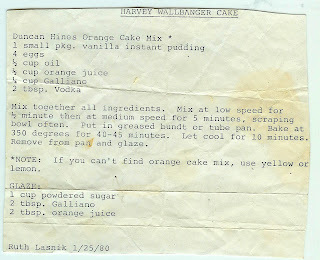 mentioned in the blog AND my gramma jean (known affectionately as madoo) made that SAME harvey wallbanger cake! until i read this, she was the only one i knew who did. i have hers written in her chicken-scratch (my grampa used to say she wrote in chinese!) i had forgotten all about that chicken dish! !